Fancy adding “honey” to your hotdog? 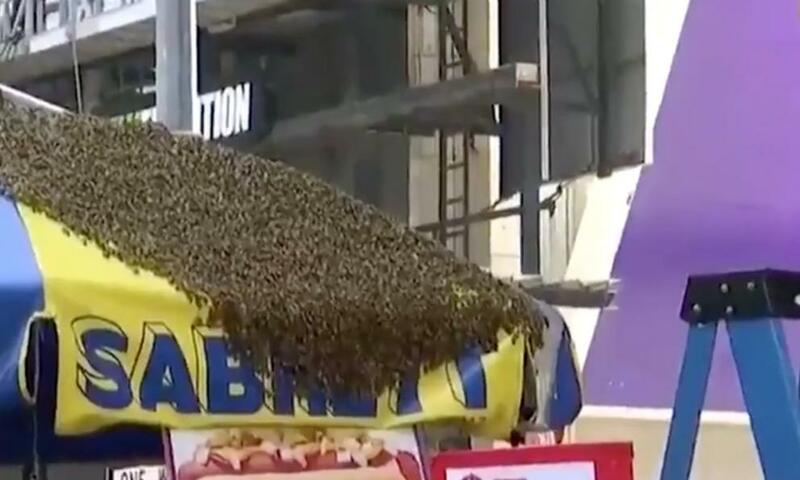 While the two don’t exactly go together, a swarm of bees numbering thousands strangely engulfed a hotdog cart in busy Times Square. Social media users were able to take videos of the odd incident and uploaded the footage online. The videos were taken on Tuesday at around 1:30 p.m. showed bees swarming above an intersection near the Hard Rock Cafe, at Broadway and Wet 43rd Street. Another video showed the almost scary sight of the insects covering almost entirely an umbrella on top of a nearby hot dog cart. A beekeeper from the city was called to respond to the situation. He carefully removed the bees from the umbrella using a vacuum to move them to a safer place (a comfy bee bag). The video also showed some stray bees were able to “get away” and made their way to the facade of a nearby cafe. The authorities have yet to clarify if they were able to establish where the bees came from, and what attracted them to the hot dog cart. It is also not known if anyone was stung by the surprise visit of the bees. WebMD says that about 2 million people in the U.S. are allergic to the venom of stinging insects. Even those who aren't allergic aren’t as safe from the effects of bee sting because of the acute pain caused by those fuzzy little critters. After the initial blast of sharp pain, a bee sting can also result in redness, swelling, and a dull ache. Bee stings can also affect pets like dogs and cats, too.